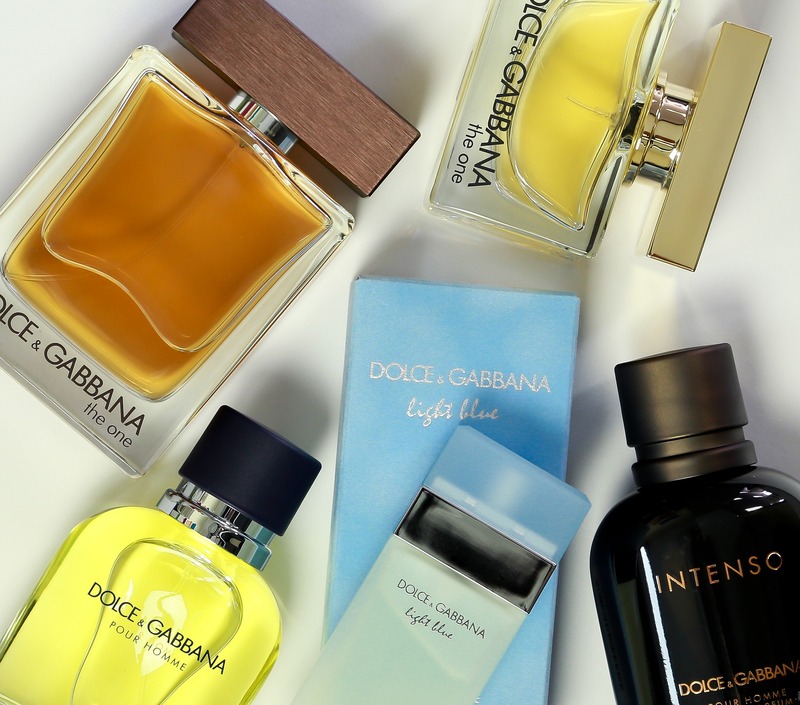 Welcome to the mini-series of What To Pack As A Man. The following three episodes present to you a list of 8 items that in any case should becoma part of your on the road-toolbox. This being said, the list on What to Pack As A Man is an essential list. It covers items that you need to take with you no matter when and no matter where you go. It is, however, not a personal list. If you were looking for the optimal amount of socks and q-tips to take with you then you came to the wrong place. These things are secondary items and all they do is depend on the length of your stay. I take it that you are old enough to pack the right amount of underwear and toiletries yourself. The Essential Travel Packing List For Men covers all those things that are crucial for the successful male traveler. I called the list an essential list – I might have as well called it a list of life-savers. Without these items your travels will not be as enjoyable and without them you are even putting yourself at risk to waste a good deal of your time with unneccassary hassle, danger and frustration. Taking a smartphone with you – and not a regular mobile phone – seems to be so self-evident that it deserves no explanation. 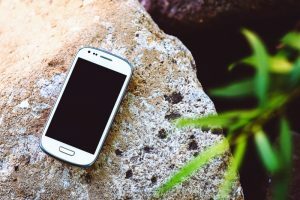 Nonetheless, the battery life of modern smartphones overflowing with features and apps that no one really needs can be so ridiculously low that taking an oldschool cell phone with you may seem like a reasonable alternative. But is it really? For me personally, owning and operating a smartphone is anything but obvious. For the majority of my travels in the past two years I used a basic Motorola cell phone that had no internet capability, no apps, no skype, no nothing. Just basic calling and texting and that was it. While this sometimes made me feel left-behind as if I couldn’t keep up with the cool kids because of my pragmatic means of communication I, nonetheless, was the proud owner of a mobile phone whose battery lasted 4 full days if you didn’t call much. And even if I dropped my phone into the coffee or the swimming pool I could be sure that it would keep on working relentlessly once it had dried up again. Apart from the battery and stability factor: To this day I believe that smart phones have a very feminine touch to them. Even today I sometimes feel uncomfortable using them. All the “swiping”, with your pinky spread out as if your were trying to act posh having a glass of tea, as well as the abundance of messaging services with all their kitsch emoticons almost have a subtle gay touch to it. On top of that these handheld-computers now come with processors that, in comparison, make the first computer I ever owned look like a 1937 Z1 developed by Konrad Zuse himself. In short, with their colorful computer screens these little power machines can be as addictive as using your desktop computer. Meaning that you are just as much at risk to get sucked into wasting time by playing games or surfing the web. Using a smartphone instead of a regular phone comes with the downside that watching videos and reading articles that have no value in themselves apart from a short-lived buzz is now a curse that can basically follow you anywhere you go. On the other hand, there are smartphone apps that I can only describe as ingenious. Take, for instance, the Uklon app developed in Ukraine. It is my personal believe that the principle behind Uber actually is a Ukrainian invention as Ukrainians have been working as self-employed taxi drivers before there even were smartphones. Now, the Uklon app lets you conveniently order taxis from/to anywhere in Ukraine while you will not pay more than any local would. The GPS picks up your address so you can order your ride without knowing a word of Cyrillic. Also you are safe from getting overcharged. Whatever Ukrainian taxi driver takes your call is unable to tell that you are a foreigner who doesn’t speak the language. And thus, trying to pull some shenanigans on you won’t cross his mind as you have the fixed price “in cold print” with your smartphone. A low-cost guarantee that comes along with total convenience? Perfect, I say. Offers on Ebay for a second-hand smartphone in good shape start at as little as 30€. The same goes for new ones that are sold around the check-out area at almost any larger stores selling electronics. Ranging between a slender 90 to a more profound 180 gramm. Try to pack an older smartphone when you travel. Pick the one that has the longest lasting battery over the one that has the most features. Leave your brandnew iPhone 12 at home and let your old but steady 2007 android smartphone be your trusted travel companion. This item depends a little on where you are going. Wearing a well-designed watch is a favorable thing to do for any man as it (figuratively) shows that you value your time. At the same time it also shows that you value yourself as you spent quite a bit on a feature where you could have easily spent a lot less. Wearing an expensive yet attractive watch naturally comes with a downside. Namely, that apart from the good attention it brings you, it will also draw attention from people that will want you no good. By that I do not mean that you will fall victim to some well-trained con artist who will slide your timepiece off your wrist with one hand while he pats you on the shoulder with the other like in a James Bond movie. What I mean is that a man’s watch is the key indicator for others to tell who he really is. All your modest clothing and even your old smartphone won’t be able to hide the fact that you are a well-off Westerner when your watch marches to a completely different tune. In fact, even if you look totally unimposing your watch may still be the one straw that breaks the camel’s back giving the average pickpocket on the Barcelona subway reason enough to nonetheless slash your bag during crowded rush-hour. When I said that the importance of this item depends a bit on where you are going is going through the roof if you are going to place with a high social disparity. Naturally, in Central America or in South East Asia will an extravagant watch will be seen more as an indicator of wealth than in, say, Eastern Europe where wearing a (fake) golden watch is one of the most common thing to do among men. Apart from that, have you ever tried seeing things from a third perspective? Namely that once you choose reliability over looks you inevitably come to realize that wearing an expensive watch as a man ultimately is like wearing some kind of jewelry. And wearing jewelry as man? I don’t think so. In closing, I can personally vouch for the Timex model pictured above. It is a super-resilient model that will go for 3 years straight without ever needing a battery change or a new wristband. 3 digital alarms which is handy when you are jetlagged and getting adjusted to a new destination. A stopwatch which is great if you are going for a short run or bike in the new destination. 2 different times that you can select for different timezones so that switching between timezones is quick and easy. When traveling, try to leave the “fancy” stuff at home and go for a classic digital watch by Timex or a comparable brand. Not only will you never feel “overdressed” you will also not draw any unwanted attention to you. And if your non-extravagant watch does get stolen or breaks apart then it’s only a minor loss because of its reasonable price. Less than 50€ for the standard model of the Timex watch. This is one of the best selling digital watches in the world. A total lightweight of only 45 gram. Be sure that the Timex model you buy features the IndiGlow electric light that you turn on by pressing the upper right button on the side of the watch. The light is easy on the eyes and evenly lights the clock face. This one is as clichè as it gets. 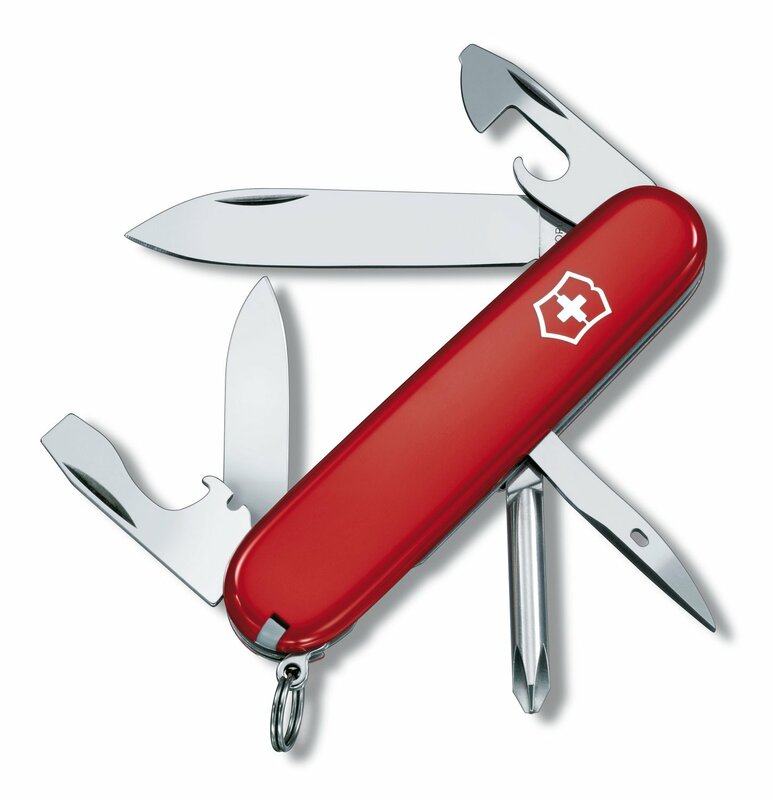 Could you think of any other item that has practical usefulness written all over it more than the Swiss Army Knife? As washed-out as the advice of taking a Swiss Army knife with you may sound: if it’s true – it’s true. Why a Swiss Army Knife? First off, the Swiss Army Knife lets you cut that loose thread that would otherwise ruin your whole shirt if it wasn’t cut off properly when there are no scissors around. Second, it will save the day by acting as your can opener if you took my advice on renting apartments over hotels in Eastern Europe and your apartment turns out not to have a can opener (many don’t). The same goes, naturally, for the not unusual case that your apartment/hotel room also lacks a corkscrew. 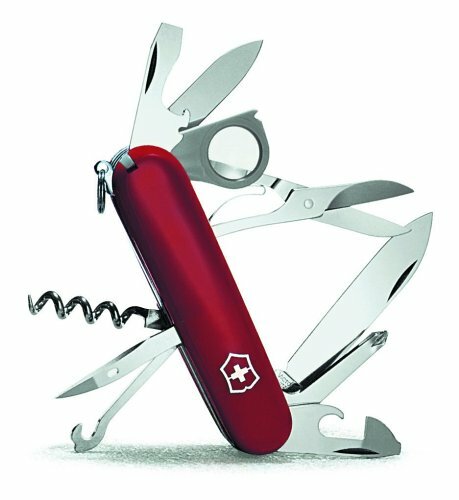 Third, the Swiss Army knife is your perfect substitute for any screwdriver, pliers or tweezers that you might need during your travels. Think about the time where you dropped that one glass on the tiled floor and where you stepped into one of these miniature glass splinters that will be around even weeks after you thoroughly cleaned everything up. And even in the case of an emergency where you have to open the case of your laptop/smartphone/computer asap and the special equipment you need to loosen those twelve tiny screws is nowhere to be found the Swiss Army Knife will have your back. In short, carrying you own SAK with you when you travel will act as your perfect allround-toolbox that is the size of a candy bar. 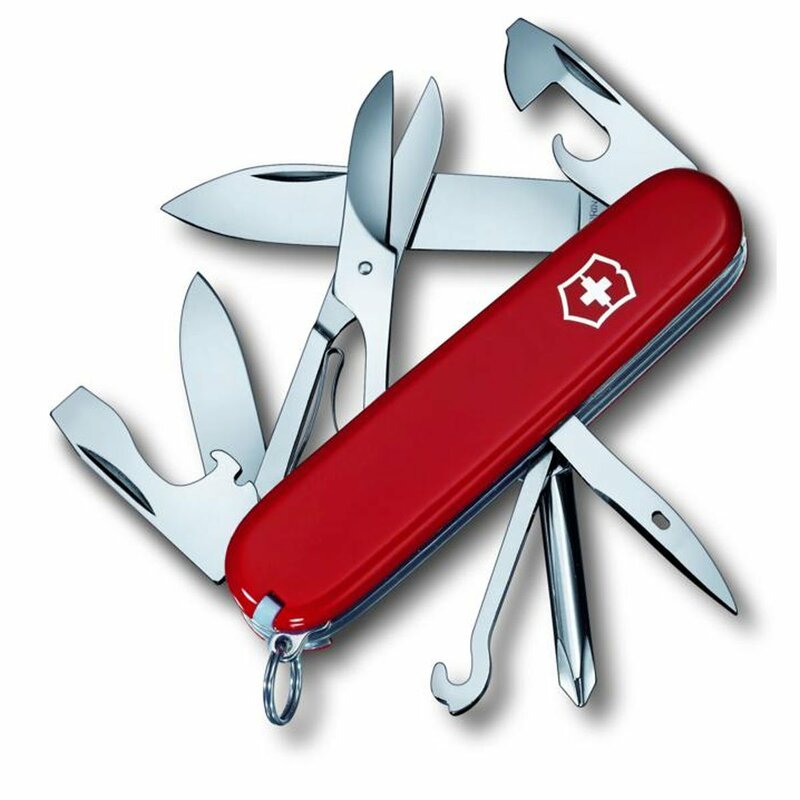 The model pictured above is the Super Tinker that will cost you 29,50€ at the official store of Victorinox or less than $30 in the US via Amazon. Unlike the Super Tinker model of 2010 as you can see it in the picture above the latest model of the Super Tinker even features a regular built-in Philips screwdriver, all for the same price. The Victorinox Explorer adds a magnifying glass to the Super Tinker model and can be found in the US on Amazon. 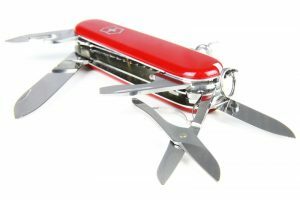 If you are willing to waive the scissors implemented in your Swiss Army Knife then the regular Tinker, the most sold Swiss Army Knife in the world, can be had for less than 20€ at the Victorinox shop or on Amazon.com. With 84 gram (3 oz) slightly above that of a Snickers bar. There is no need to go for one of the fancier models that come in more ergonimic shapes, in more eye-catching colors or have built-in Flash Drives. The non-sophisticated models not only look more “classic”, they will also serve all your needs just fine. And speaking of Flash Drives, what’s the point of carrying a Swiss Army Knife if you cannot even drop it or let it get wet without losing one of its functions? MacGyver never had a flash drive in his Swiss Army Knife and neither should you. An additional post discussing new gadgets, accesssories, etc that make traveling for men easier and more fun can be found at Best Travel Accessories.